Delaware Governor Thomas Carper celebrates the Broadkill Beach Sanctuary with ERDG president Glenn Gauvry and the 2000 Horseshoe Crab and the Arts contest winners. The future survival of the world’s four remaining horseshoe crab species will ultimately depend upon the preservation of its spawning habitat — a challenging prospect in light of the ever-increasing human density along the same inland beaches horseshoe crabs have relied upon for thousands of years. To respond to this challenge, ERDG launched its Backyard Stewardship™ community based horseshoe crab sanctuary program in 1999, designed to encourage coastal communities to declare their shared habitat a horseshoe crab conservation area or sanctuary. 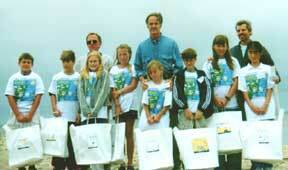 On June 13th, 2000, then Delaware Governor Thomas Carper visited Broadkill Beach, Delaware to recognize this community for working with ERDG in establishing Delaware’s first community based horseshoe crab sanctuary. ERDG is the only organization that has been successful in convincing residential landowners to designate their private beaches as horseshoe crab sanctuaries. In addition to Broadkill Beach, ERDG has also enrolled the Delaware bayshore communities of Pickering Beach, Kitts Hummock, Slaughter Beach, Prime Hook National Wildlife Refuge (Fowler Beach), Prime Hook Beach and Camp Arrowhead on Rehoboth Bay. 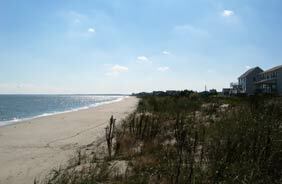 ERDG has also enrolled the New Jersey bayshore communities of Fortescue, Gandy’s Beach and Money Island. ERDG is currently working to establish additional horseshoe crab conservation areas within communities throughout the Atlantic Coast of the United States. To date over 16 miles of prime horseshoe crab spawning habitat has been protected through this program. Ultimately, our goal is to protect the horseshoe crab spawning habitat throughout out the species spawning range worldwide. Creating a sanctuary is simply a community's expression about how they view their beach and the natural resource they share. Some communities have gone as far as to make the horseshoe crab their town symbol, others just quietly enjoy the resource and educate their friends, neighbors and visitors. The existence of a State or Federal harvesting moratorium on horseshoe crabs has little to do with what lies at the core of conservation i.e., compassion for other living beings. So the purpose of the sanctuary is to change the relationship communities have with their natural resources, which will far outlive the regulatory process.